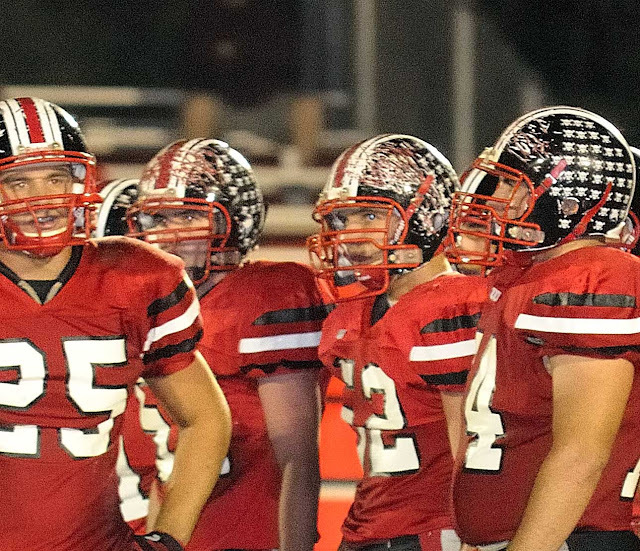 Orrville Red Rider Sports Blog: What's up with the Orrville helmets? Take a look at the helmets of the two guys right beside Mason Monheim (#25)....have you ever seen an Orrville helmet so busted up? Wow, that's excessive...looks like the helmet met the grinder in Industrial Tech class. The guys who it seems to be worst on are Derek Graber (#51) and Trevor White (#52). Regardless of who it is, I don't recall seeing a helmet have this much damage on it...EVER. I wonder if the helmets are being painted differently or what...but something has definitely changed. I know the guys probably see it as a "battle scar," and I get that...but so is wearing the black Orrville helmet with a side full of skulls. I don't know if you can get skulls on those helmets anymore. I did hear that the stripes are actually part of the paint job, and not tape or decals anymore. That's relatively new, and maybe part of the problem. But why is the white and red showing through on the sides? If the scuffs were black like the outer shell of the helmet, I doubt it would be as noticeable. Whatever the reason, someone needs to touch those up...pronto. I would agree, I prefer the cleaner look. Just my opinion. 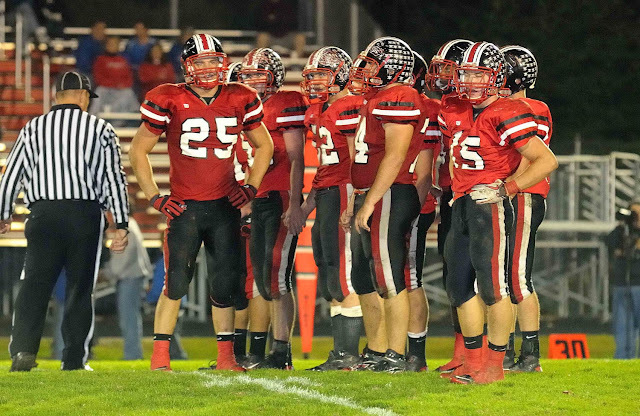 But I still think Orrville has THE best looking color/design scheme though. 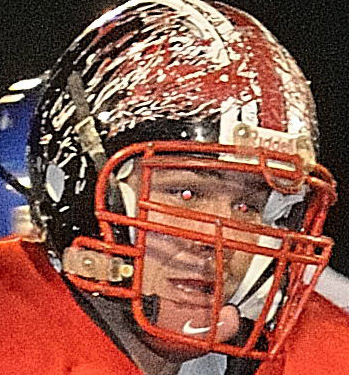 I prefer they take off the stripes and skulls and everything like Massillon did after first loss - why? not because they lost to a better team but becasue once agin they were out disciplined and out hustled and that is not Red Rider football. This team is frustrating to watch and the fans i sat by Friday agreed 100%. Shirts untucked, walking off the field, personal fouls, helmets being taken off, what ever happened top Red RIder Football? Do they give out skulls for anything now? I played both ways on one of our best teams, and I never had that many skulls by week 7, let alone the whole year. Well from being a recent former Red Rider I would confirm that that they battle scars and scratches on the helmets are definitely in the players favor. For just the reason of having that tough feeling and being able to see what scars are from what game, but i do agree that they need some repairs. They give skulls out every time Orrville wins and everyone automatically gets one skull for the win. Then depending how much you played whether both ways, special teams, or everything and depending on how good of a game that particular team you were on had that game would determine the number of skulls the player would receive.